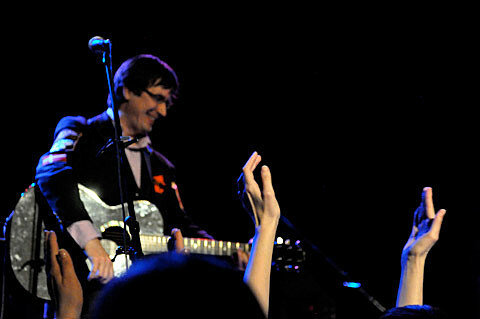 Michael Dorf’s (founder of Knitting Factory) series of tribute concerts to benefit music education programs for underprivileged youth (which last paid tribute to Neil Young in February) will continue on March 13, 2012 at Carnegie Hall, when 21 different artists will perform the 21 songs from The Rolling Stones‘ massive document of the early part of their long withstanding career, Hot Rocks 1964-1971. The compilation was released at the tail end of 1971, and was filled with the bluesy cuts that they used to leave their stamp on popular music (though notably includes no tracks from the psychedelic trip they took on Their Satanic Majesties Request in 1967) before putting together the colossal double album Exile On Main St. a few months later. So far the artists that will be participating in the show include The Mountain Goats, Glen Hansard, Steve Earle, Rosanne Cash, Rich Robinson, and Carolina Chocolate Drops. More TBA soon. Tickets for the show are on sale now. Meanwhile, Steve Earle will be kicking off a residency at Michael Dorf’s venue City Winery with Allison Moorer and friends in January. The residency will take place every monday over the five week period of January 9 through February 6. Tickets for all five shows are on sale now. The Carnegie Hall show in March won’t be the first time Steve has covered the Stones. He’s been known to cover “Dead Flowers” at his shows. You can listen to a version recorded live in Calgary that appeared on the deluxe edition of his 1988 album Copperhead Road below. The Mountain Goats, who also play at the Stones tribute, will be sticking around after the Carnegie Hall show to play NYC’s Ecstatic Music Festival later that month. They’ll be performing material with vocal quartet Anonymous 4 that frontman John Darnielle wrote for his new project Transcendental Youth, with arrangements by Owen Pallett. They play on March 24 at Merkin Concert Hall. Tickets for the show are still on sale. John Darnielle also just announced a bunch more 2012 dates, all of which are listed below.